There’s so much to Berlin, and that’s probably why for so many people these days it’s the ultimate international city. The nightlife is hipper than New York and it’s as culturally and historically rich as London or Paris, plus it’s always been a powerhouse of creativity. And when it comes to the best places to stay in Berlin it’s an understatement to say you’re inundated with choice. Berlin is multicultural and gritty, but also glamorous and grand. The impressive architecture and statuary sit in amongst welcoming green spaces and fantastic cafe strips where there’s something going on 24hours a day. And, of course, the food is everything it’s cracked up to be. This is a big city, but the districts you’ll want to visit are small and compact and easy to get around on foot. So even after a few days you’ll develop a relationship with this place. 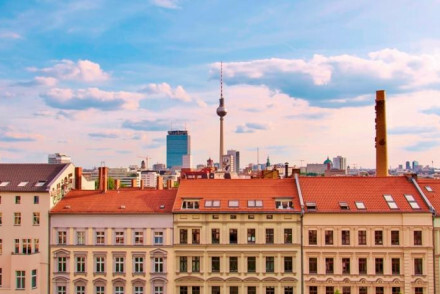 It makes a difference where you stay, but our Gurus have recommendations for the best places to stay in Berlin all over town, so if you choose your area first it might help you with a short list. Berlin’s centre is called ‘Mitte’ or middle, and this is where you’ll find many of the tourist hubs like Potsdamer Platz and Alexanderplatz, plus the Reichstag and reams of great cafes and restaurants. If this sounds like the area you'd like to stay in here are our recommendations for the 10 Best Hotels in Mitte, Berlin. 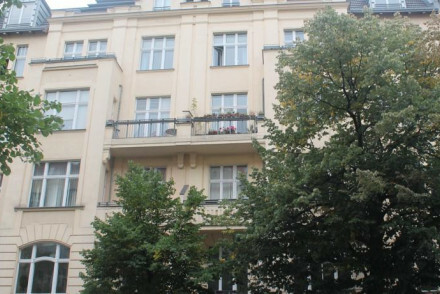 Just to the north is elegant, residential Prenzlauer Berg. The area is incredibly family-friendly, with plenty of cafés, ice cream shops and playgrounds. We have a list of the 3 Best Hotels in Prenzlauer Berg to recommend? Charlottenburg has recently been redeveloped and is now a great place to find chic hotels as well as boutique shopping. The magnificent Charlottenburg Palace is an absolute must-visit! 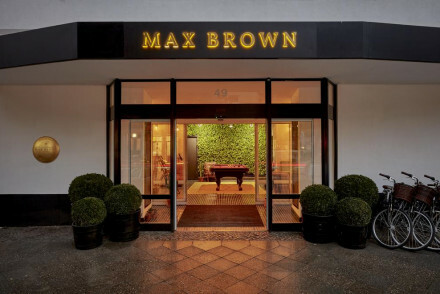 We recommend 5 Best Hotels in Charlottenburg to start your search here. Friedrichshain was part of East Berlin, but has been gentrified since reunification. That said, it’s still a bit edgy; featuring plenty of indie cinemas, skate parks, great breweries and more. We've picked the 3 Best Hotels in Friedrichshain to get you started. While across the canal Kreuzberg has been edgy and liberal for a while, and we have picks for the 3 Best Hotels in Kreuzberg too. Alt-Treptow and Neukölln are perfect for those wanting a bit more peace and quiet; the districts are home to the Plänterwald forests and Treptower Park, but are still close enough to all the city's main sights. Berlin is rife with iconic sights and sites, both old and new. Obviously the 18th century neoclassical icon that is the Brandenburg Gate is unmissable - and not just because of its size, but many people would argue that so are some of the dilapidating communist structures, made famous recently for the wonderful way they’ve been set upon by street artists and graffiti artists. Seeing these places, along with the remains of The Wall, Checkpoint Charlie, Hitler’s Bunker and the Holocaust Memorial will really give you a sense of the drama that’s unfolded here. Berlin has had a disproportionately large effect on European history and it’s been the location for more than its fair share of meaningful events. And you can see this wherever you look, from the Reichstag to Sanssouci Palace and the Museumsinsel (which translates to ‘Museum Island’). Museum Island is also known for the Pergamon Museum, which sits outside Berlin’s own history and has an amazing collection of world renowned Ancient Greek, Middle-Eastern and Islamic art and artefacts. The Deutsches Historisches Museum is where to go if you do want to focus on Berlin’s, and Germany’s, history. The Gemäldegalerie is an incredible collection of European art housed in an incredible building, and the Berlinische Galerie is Berlin’s modern art and design museum. These days Berlin also has more than its fair share of cool. Private galleries are bursting with creativity, the theatre and music venues seem to be everywhere and always offering something new, and you’ll find the hippest DJs in the clubs. And of course this has always been a place to eat, drink and be merry. Take a break in Tiergarten Park when you need it. Berlin’s energy is probably why its story is one of evolution and survival, despite hundreds of tumultuous years. Vibrant and cutting edge, there really is something for everyone here. 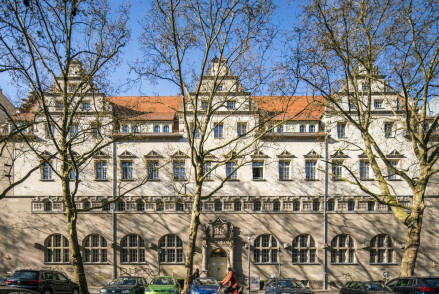 Our Guru's recommendations for the best places to stay in Berlin range from the sumptuous Hotel de Rome, one of Rocco Forte's finest, to Die Fabrik a budget establishment ideal for those wanting to save their pennies for the pubs and clubs. 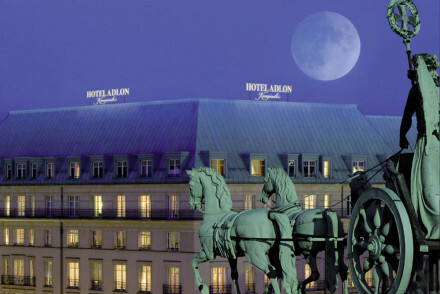 The Hotel Adlon Kempinski, Berlin's grand dame, oozes luxury and sophistication. Featuring large rooms complete with elegant furniture, there's also a superb spa in which to unwind and fabulous breakfast buffets served each morning. A dreamy city spot. Mandala Hotel offers spacious and contemporary suites just a stone's throw from the city's main attractions. With a Michelin starred restaurant and a spa, this is the ideal modern city break. 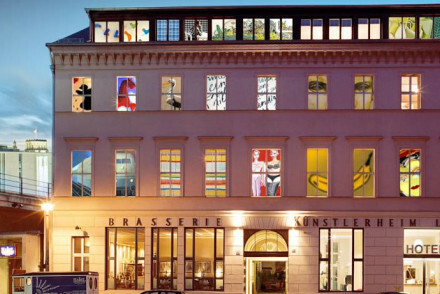 Arte Luise Kunsthotel offers eclectic and funky rooms designed by different artists. Sculptures in the communal areas add to the place's gallery feel and it's a great value spot given its central location. Hotel de Rome is a wonderful example of contemporary elegance. It offers sleek suites and a rooftop terrace with superb views - the ideal spot to enjoy a tipple after a long day out! A top choice. The Circus offers individually designed rooms with plenty of bold colours and pop art used throughout. What's more, there are two bedroom apartments (ideal for families), as well as a restaurant serving regional cuisine. The characterful Monbijou Hotel enjoys a superbly central location and offers smart accommodation. 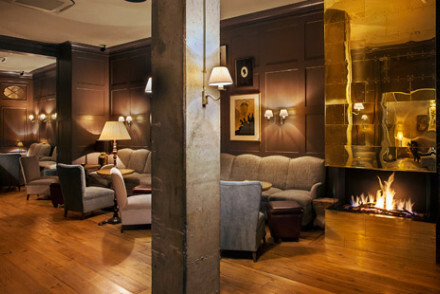 You'll love the cosy feel of the library, complete with log fires and wood panelling, whilst there's also a Parisian restaurant on site. Wonderful value. The Regent is another obvious choice, with wood-panelled interiors and chandeliers. A home from home for the glitterati, it also boasts two Michelin starred dining and has long been feted as one of the best places to stay in Berlin. Boasting a townhouse setting, Honigmond is a traditional stay with a lovely garden. Ideal for romantic breaks. 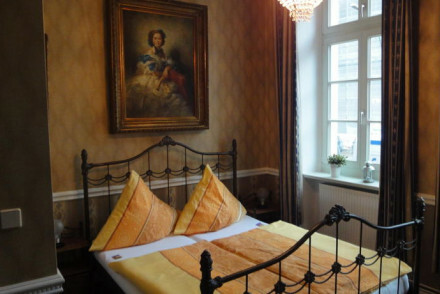 Art Nouveau, located around the corner from the bustling Savignyplatz Square, offers charming accommodation featuring plenty of vibrant colours. An unfussy and friendly option, there's an honesty bar in the communal salon and organic breakfasts are served each morning. The Ellington's 1920s facade belies its crisp, contemporary interiors with minimalist Scandinavian-style white on white rooms. Enjoy wonderful meals at their restaurant, and make the most out of your location to see all that the city has to offer. Hotel Q, located just off Kurfürstendamm and its wealth of retail options, is an uber trendy design spot. 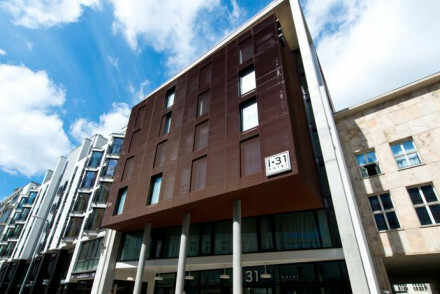 Offering contemporary minimalist accommodation, a spa and a superb Thai restaurant, it's a great modern city spot. 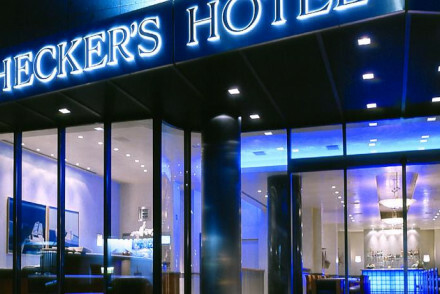 The Heckers Hotel seamlessly blends contemporary common areas with faux-traditional accommodation (think neutral colours, rich fabrics and dark wooden furniture). Enjoy meals from the on site Greek brasserie - and all of this at superb value! Das Stue, housed in a former 1930s embassy, boasts contemporary accommodation with splashes of modern artwork on the walls and plenty of natural light. A stylish base from which to get to know Berlin. Hotel Zoo offers uber-contemporary luxury accommodation with open-plan bathrooms and plenty of vibrant colours. Enjoy splendid meals from the restaurant and make the most out of your location (on the renowned Kurfurstendamm street) to fully explore the city. 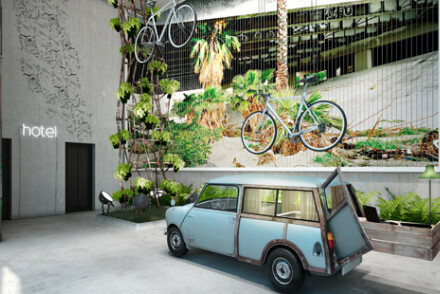 25 Hours Hotel Bikini Berlin is a quirky take on contemporary living. Set in an old office block, it boasts cool contemporary accommodation and open common spaces with exposed concrete walls and plenty of plants. A hip spot! 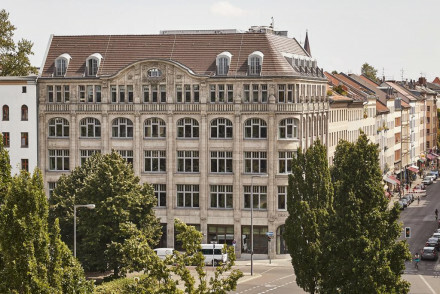 The trendy Michelberger Hotel is an ideal spot for young travellers. With themed rooms featuring the bare necessities and a bar (not to mention the beer garden! ), it's a great place to meet fellow tourists. NHOW is an ultra-cool stay: featuring futuristic rooms and cutting-edge design. Enjoy a drink on the riverside terrace after a day spent sightseeing. Die Fabrik, set in a pre-war brick factory, is a great way to see Berlin on a budget. This hostel offers both individual bedrooms and dormitories for groups, whilst there's also a cafe with a courtyard where you can relax and meet other guests. The quirky Huttenplast offers truly unique accommodation, ranging from caravans and log cabins to more conventional bedrooms. With family rooms available and bikes to hire if you want to explore the city, it's a fun and decent value all round stay. Berlin has two airports: Berlin-Tegel and Berlin-Schönefeld. Berlin-Tegel is marginally closer to the centre of town, but Berlin-Schönefeld is being expanded, so watch this space. From Berlin-Tegel to the centre of town it’s just 20 minutes on the X9 Express Bus, which departs every ten minutes. From Berlin-Schönefeld you can catch the train on the S9 line to Ostkreuz, then transfer to lines S5, S7 or S75 to get to Berlin Central Station. Or, you can take the regional RE7 and RB14 trains which take around 30 minutes to reach Central Station. Of course Berlin Central Station is an international rail station, which connects to the Eurostar lines as well as other European railways, so you can easily arrive by train. If you want to hire a car while in Berlin we recommend you visit our online partner, Rentalcars. Berlin is busiest over the summer, so if you’re not put off by cooler weather then it’s probably best to visit when it’s quieter in April/May or September/October. During these shoulder seasons you can expect weather averages around 10°C, and for accommodation to be better value. If you like the cold, Berlin is also a great place to visit during the Christmas season - the city is beautifully decorated and there’s plenty of gluhwein and good cheer. Still not sure which is the best place to stay in Berlin for you? 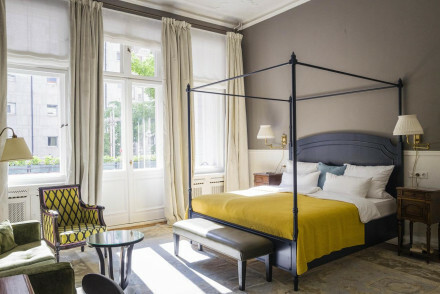 You might want to refine your search to just the 10 Best Hotels in Mitte? or the 3 Best Hotels in Prenzlauer Berg? or the 5 Best Hotels in Charlottenberg? or the 3 Best Hotels in Friedrichshain? 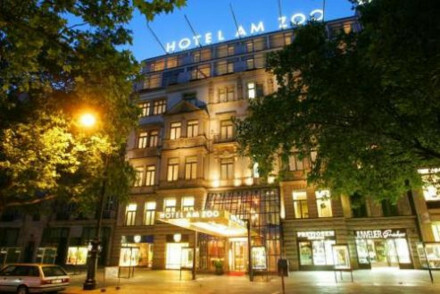 or the 3 Best Hotels in Kreuzberg? Or you could expand your search to include the neighbouring city of Potsdam? Or contact one of our friendly Gurus for personalised advice. 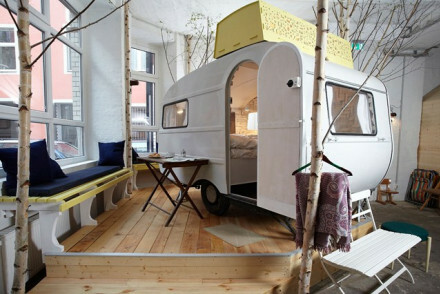 Quietly located in Berlin's trendy Neukölln district, this quirky hotel has 18 unique and original rooms. Stay in caravans, log cabins or comfortable, contemporary bedrooms. Huttenpalast is located near hundreds of interesting bars, restaurants and clubs - a perfect hub for exploring the city. Close to nightlife - Lots of interesting bars, cafes, restaurants within 5 min walk of hotel. A chic modern hotel in the quiet Charlottenburg district. Minimalist styled rooms are individually designed and boast high ceilings and enormous sash windows. A lively bar complete with billiard table and excellent breakfasts are on offer. A reasonably priced option for the design conscious. Value chic - A hip spot in leafy Charlottenburg offered at very reasonable rates. 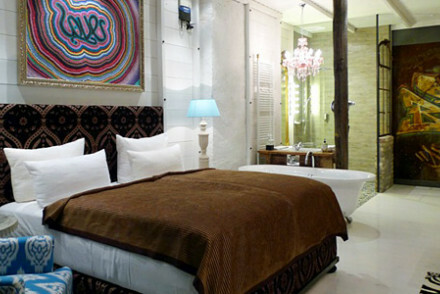 Eclectic, funky hotel with rooms designed by different artists. Each room is as whacky as the next - the themes jump from time, to space, to travel. The sculptures in the lobby and philosophy in the stairwell accompany the guests en route rather like an art gallery in which you can stay the night. Writing a novel - Artists stay for free if they contribute to the project, thus you'll always find a creative crowd hanging around the courtyard! Value chic - An unheard of price for this prime central location, not to mention the funky design and interesting folks you'll meet here. Local markets - A 20 minute walk brings you to The Gendarmenmarkt, a lovely open square that holds one of the city's famed Christmas markets. Sights nearby - The Reichstag Dome is only five minutes down the road, climb the double helix walkway for the best viewpoint over the city. 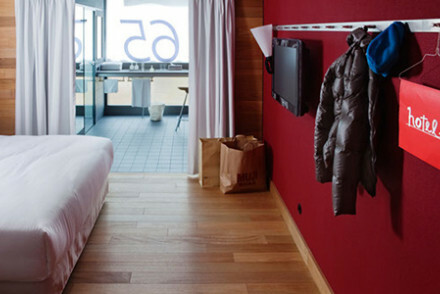 Large contemporary minimalist hotel, cool and affordable. Huge simple rooms with lots of natural light, pale colours, and minimalist furniture. Bar, in-room massage, and entertainment twice a month. A great choice for those looking for something functional and understated. Lively - Twice a month a DJ plays in the bar. A stylish hotel set in the heart of the city. Contemporary rooms are light and airy with floor to ceiling windows, crisp white linen and polished wooden floors. A rooftop bar is the perfect spot to enjoy an evening tipple. A trendy spot offered at very attractive prices. 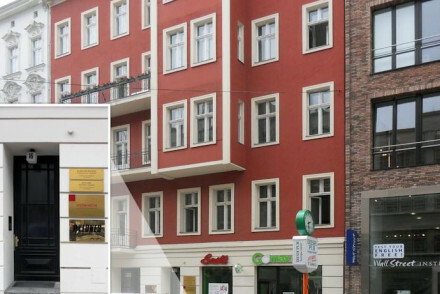 Local exploring - Located in the heart of Berlin offering easy access across the city. Great walks - Take a stroll down the beautiful Unter den Linden boulevard. 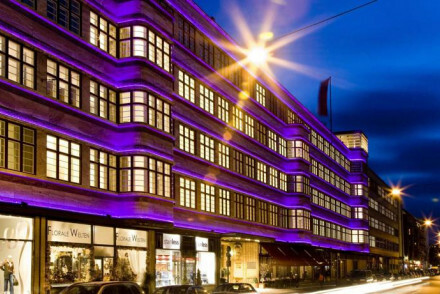 A super trendy design hotel off the main retail street Kurfürstendamm. Contemporary rooms and suites with minimal furnishings and all the mod cons, lively member's only bar, top of the range spa, and a Thai restaurant. A highly coveted spot for movers and shakers. City Style - Cutting edge design and a covetted member's only bar. Bar - Lively, member's only, plus guests. Sights nearby - Around the corner is the Kaiser Wilhelm Memorial Church. The bare necessities in a hip, urban, youthful hotel. Rooms designed according to themes - think flea market collectibles scattered through 'the library' or 'the chalet', for example. Inexpensive and cool. Lively - Trendy, urban, youthful. A modern revamp of a classic Art Nouveau building. Charming rooms feature wooden floors and contemporary touches, think vast photos of gourds and Alice-in-Wonderland mirrors. Delicious organic breakfast is served in the bright and airy dining room. A fun and vibrant spot for exploring the city. Value chic - Wooden floors and high ceilings meet cutting edge art and funky design, at a reasonable price tag. The newest hotel in the Circus group following the ever-popular hostel. Creative design throughout. Bold colours in the individually designed rooms and some feature large works of pop-art. Regional-modern cuisine and an excellent cocktail list. Well positioned for city exploring. Local exploring - Located in Berlin’s central district surrounded by galleries, restaurants and bars. Value chic - Abundant style and devilishly good prices. Sights nearby - Visit the Berlin Wall, the Soviet Embassy and Alexanderplatz. A charming owner-managed boutique hotel. The four rooms are all individually styled with bright colours and traditional features. A hearty breakfast is served. Just minutes from the underground and plenty of bars, restaurants and shops in the area. An ideal base for city exploration. Local exploring - A small boutique hotel with great transport connections. Sights nearby - Visit some of Berlin's most iconic sights including Alexanderplatz, The Berlin Wall and Check Point Charlie. 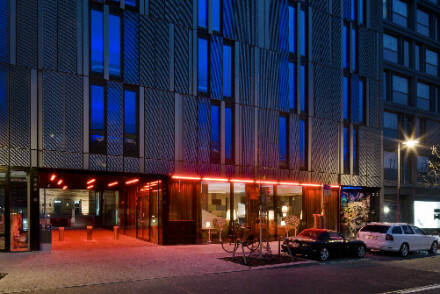 A contemporary hotel in West Berlin's Mitte district. Large spaces have sleek lines and minimalist furnishings. Rooftop terrace, lively bar, fitness centre and excellent business facilities. Cosmopolitan with the right touch of sombreness. Ideal for leisure travellers as well as business visitors. Subtly modern, lots of natural light, simple rooms in a sleepy part of Berlin. Lovely courtyard, spa, and restaurant inspired by New York. A great city choice for those looking for something less avant garde. An eclectic mix of contemporary design and elegance. An iconic bar and steakhouse restaurant, small gym, and sophisticated suites with private balconies. A grown up spot with oodles of character. The coolest place in town. 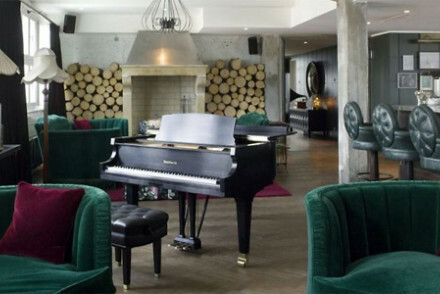 Soho House is a playground for grown-ups. Chic boutique rooms and self-catering apartments, all completely different but equally as special as the next. Busy bistro, fantastic roof top bar and pool, gym and spa area. Young, fun, luxurious. Roof terrace - With bar and pool. 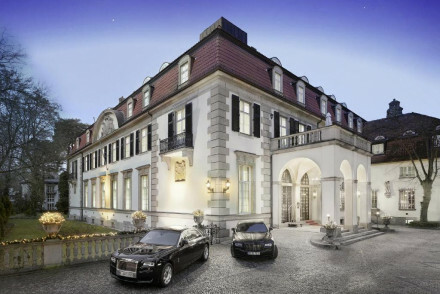 Privately run 4* luxury in West Berlin offering prime location. Contemporary rooms furnished with faux-traditional elegance - neutral colours, rich fabrics and dark wooden furniture. The bathrooms are lavish. Restaurant, terrace and bar are lively. An understated and extremely comfortable choice. Sights nearby - The government district around the Reichstag is a short bus ride away and a great afternoon. 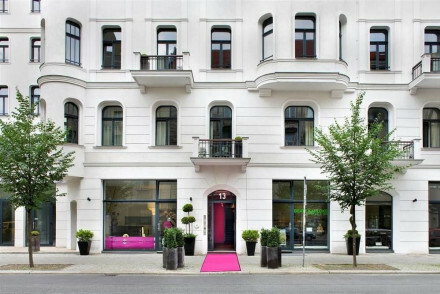 This four-star design hotel is located in the heart of Berlin, close to the trendy Kreuzberg area. The comfortable rooms have a bold, modern style and luxury finish. 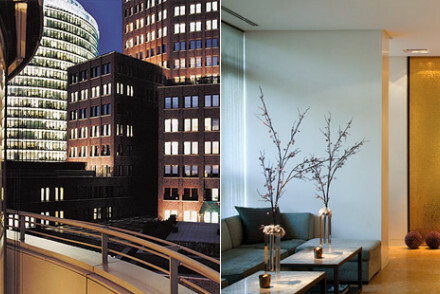 Choose between three contemporary restaurants and a chic bar with panoramic views over Berlin. A smart city choice. A contemporary luxury hotel set on the river in a serene part of Berlin. Light airy rooms and suites have large warehouse-style windows. Soft hues are livened by pops of green. A laid-back restaurant boasts lovely river views. Hire a hotel bike for easy access to all the action. A sleek property. 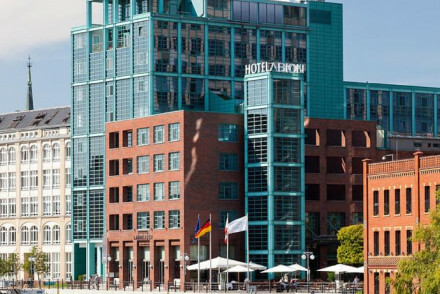 City Style - A slick modern hotel spectacularly positioned right on the river Spree. Sights nearby - Not to miss sights include Alexanderplatz, Eastside Gallery and Check Point Charlie but the list of sights is endless. Hip West-Berlin hotel with lavish, quirky interiors created by a well-known Israeli designer. The Asian-style restaurant is run by an award-winning chef, and the happening bar draws a stylish crowd with its weekend DJ sets. Rooms are decorated with sumptuous furnishings and bathrooms are luxurious. 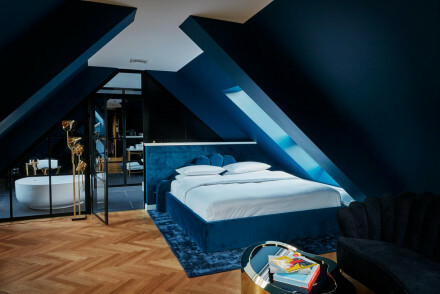 A chic hotel in hip West Berlin housed in a 19th century building. Fusing retro eclecticism with modern practicality, it has a home away from home feel. Rooms are spacious and stylish with gorgeous sash windows. Breakfast and light evening meals are served. A real winner! A hip destination for movers and shakers in the revellers' district, Mitte. Urban-chic contemporary rooms with white washed walls and designer bed pods. Fantastic roof top bar, lots of parties, restaurant, and excellent spa. Sights nearby - Plenty of major attractions can be reached on foot. 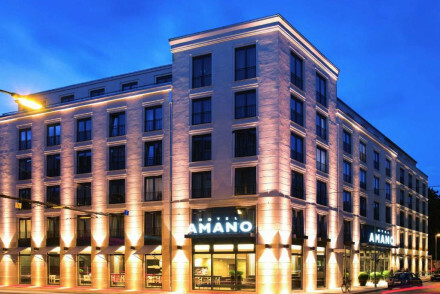 A chic and modern hotel located in the bustling Mitte district, close by to restaurants, bars and shops. Rooms are in contemporary style with comfort facilities. The bar is elegant with sleek design and a sumptuous buffet breakfast is served every morning. Super-central. 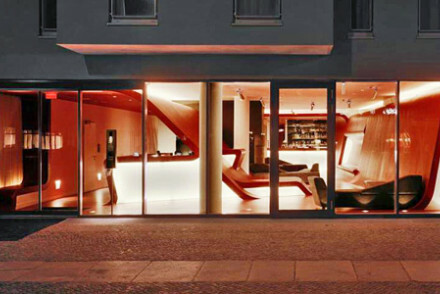 A smart and graceful hotel in one of Berlin's liveliest areas. Black and white bedrooms with modern art and private balconies. Trendy bar and lobby area with lots of white leather and animal hide throws. Sophisticated contemporary elegance. A lovely townhouse hotel with a beautiful garden. Very traditional rooms have floral wallpapers and oil paintings. Slightly old fashioned, but a good choice for the sophisticated traveller. 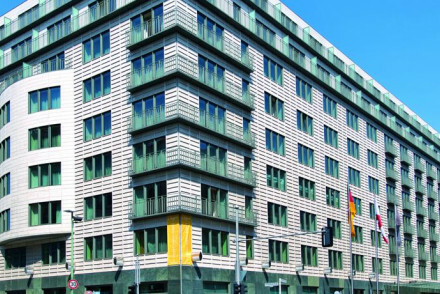 Cool, all-white new addition to central Berlin's hotels. This fabulous 1920s facade has slick and trendy interiors. Extensive banqueting facilities make perfect spaces for private events, bright Scandinavian-esque white on white rooms, and a great restaurant. A stylish choice. City Style - Uber sleek minimalist rooms behind a Weimar-style facade, that was previously the famous West Berlin jazz club the Badewanne. Value chic - Prime location, fantastic facilities, beautiful contemporary rooms with a funky jazz theme throught- for peanuts! Great walks - The Zoo and Gardens are just a few minutes down the road and well worth checking out on a sunny afternoon. 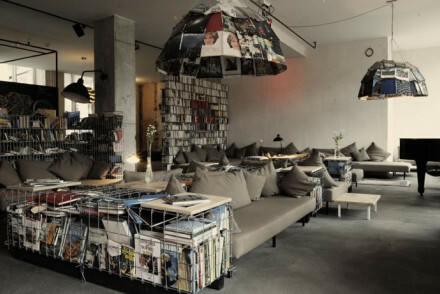 A trendy hotel in the edgy neighbourhood of eastern Kreuzberg. Light bright rooms are individually styled yet follow a similar colour theme of natural tones set against red hues. With culture highly celebrated there's both a concert area and literary salon. The restaurant is fantastic too. 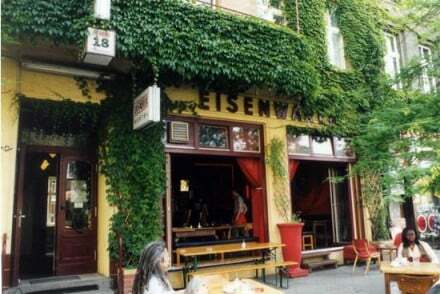 City Style - Located in the trendy neighbourhood of eastern Kreuzberg filled with independent bars and restaurants. A luxury hotel in the heart of Berlin with a stylish converted warehouse feel. Guests can enjoy the fine, grill restaurant and an extensive Turkish spa. Rooms are decorated in warming, earthy colours and private balconies with city views are available on request. A truly boutique collection of two hotels with rooms and a few self-catering apartments. Bedrooms have around the world themes - think Africa, Rome, China - in vibrant colours with stand alone bathtubs. A great choice for families, groups and couples. Sights nearby - ewish cemetery on Schönhauser Allee. A simple hotel in a classical 19th century building. Well maintained, full of charm and close to museums and nightlife. Basic rooms, lovely lobby bar with parquet flooring and Cuban-style tables, and an English-style tea room. Convenient and comfortable for city exploring. 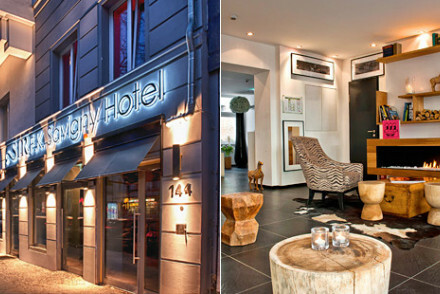 City Style - A 4 star boutique hotel in the trendy Prenzlauer Berg district, boasting leafy garden and pampering spa facilities. Sights nearby - The famed Alexanderplatz square is just one stop away on the metro. A historic 19th century bath house conversion. Interiors have an industrial-chic feel with bare brick walls, beams and distressed paint finished in pastel hues. An impressive indoor swimming pool surrounded by grand arches is a real bonus and the spacious bar and restaurant area is hip and buzzing. 25Hours Bikini Berlin is a design hotel in West Berlin, part of the hip 25 Hours boutique hotel chain. 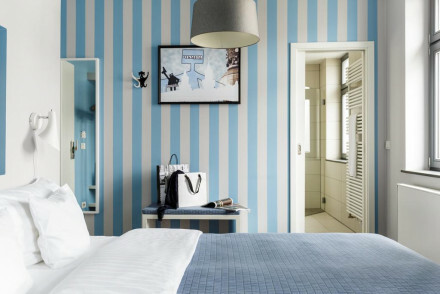 With an urban jungle theme, direct views over the Zoologischen Garten, quirky rooms and a buzzy rooftop bar and restaurant, the hotel encapsulates the creative and vibrant energy of the city. City Style - Located in West Berlin’s old centre, between Tiergarten Park, the Berlin Zoo and the retail heart, Kurfürstendamm. Designer - Cutting egde design has transformed an old office space into an urban paradise. Roof terrace - Lively rooftop Monkey Bar. Contemporary cutting-edge design hotel. Futuristic rooms have bubble gum colours and curvaceous furniture. Two recording studios, restaurant, and spa. A hip destination. 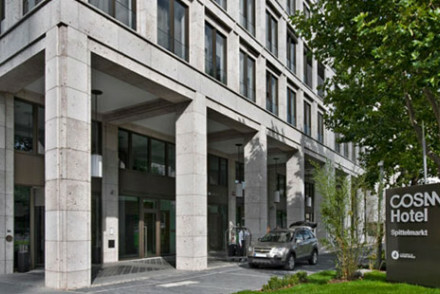 Contemporary hotel in central Berlin with a popular restaurant, small gym, and within striking distance of the trendiest areas. Bedrooms and suites have light parquet floors, red walls, and all the modern gadgetry necessary. A cool city spot. Spectacularly modern and spacious suites in a large hotel. Michelin starred restaurant, extensive spa, and excellent meeting rooms. Fantastic penthouse suite at the top. Ideal for any modern city visitor. Stylish and gourmet. 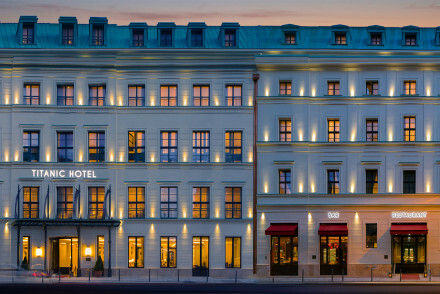 A renovated palace located in one of Berlin's smartest districts. Designed by fashionista Patrick Hellman attention has unsurprisingly been paid to every lavish detail. Sip a cocktail in the glamorous GQ Bar, unwind in the indulgent spa and have joyfully easy access to all the city has to offer. 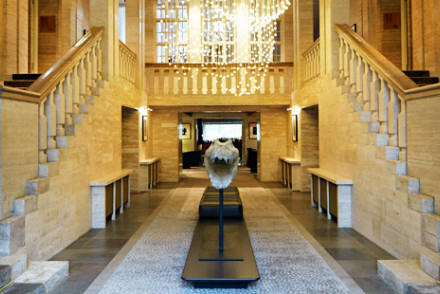 City Style - A converted palace in one of Berlin's swishest neighbourhoods boasting elegant design and luxury service. 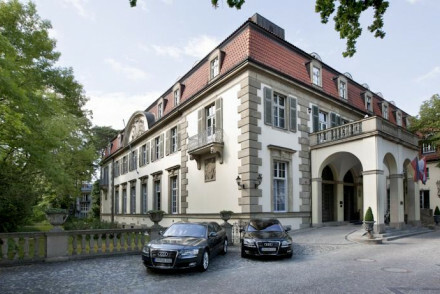 Previously an embassy in the 1930s, now an upmarket boutique hotel with a Michelin starred kitchen and excellent spa. Contemporary bedrooms and suites have light wood floors, lots of natural light, and splashes of modern art. A very stylish spot with all the trimmings. Foodies - Michelin starred chef. 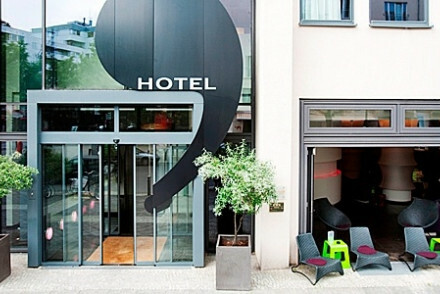 A stylish and quirky hotel in a well known shopping street of Berlin. Rooms are uniquely designed, uber luxurious and some with open plan bathrooms. Also features a fine dining restaurant, a chic bar and fitness centre. Has been a popular hub with celebrities in the past, evokes classic elegance. 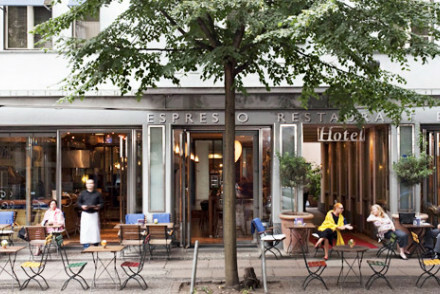 Cool, easy-going designer hotel in a lively part of East Berlin. White on white studio rooms with magenta throws, kitchenettes and rain showers. A unique Aveda HairSpa and excellent Japanese/Italian fusion restaurant. A fashionable spot on the doorstep of galleries, restaurants, and shops. City Style - Designer-architects Claudio Silverstein and Giulana Salmaso have crafted a sleek space unique in this edgy trendy part of town. Great walks - Alexanderplatz is one of the most famous squares of Berlin. A 1912 courtier's palace decorated by Karl Lagerfeld just outside Berlin in the leafy Grunewald suburbs. Opulence and grandeur from head to toe - rich crushed velvet fabrics, mahogany furniture, marble fireplaces, parquet floors, oil paintings. Two restaurants and a good spa. A lavish spot. City Style - Spend your day being chauffeured around Berlin in a Rolls Royce, followed by an evening drink in the Tire Bouchon smoking salon. Total relaxation - This hotel was built for luxurious repose, from spa treatments to beds of the finest fabrics and knockout dining. Great walks - Near several small lakes and surrounded with wooded trails, plus the hotel will prepare private picnics for you. 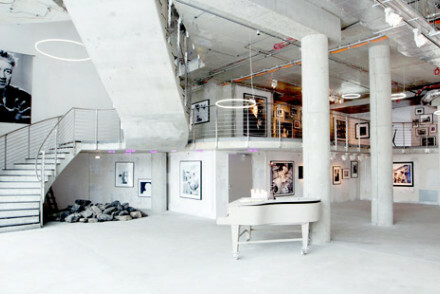 Designer - Karl Lagerfeld and Patrick Hellmann had a strong hand in the interiors. One of Rocco Forte's finest hotels. 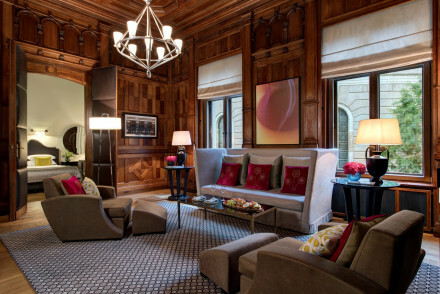 Architectural splendour and grand interiors that ooze contemporary elegance. 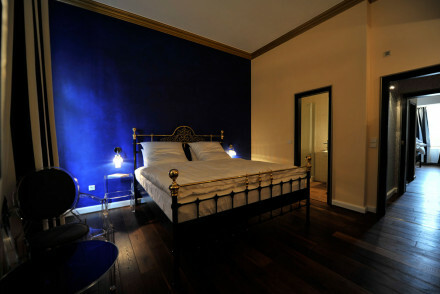 Sleek rooms and suites in blues, reds and beiges. 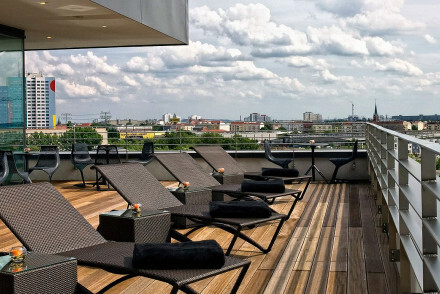 Fantastic roof top terrace bar/lounge with unrivalled views of Berlin, great spa. An ultra-stylish spot for any city visitor. Glitter and practicality combined in a well-run hotel. Highly polished marble, panelled public rooms, chandeliers, Victorian landscapes and English period prints. A sophisticated hotel with a double Michelin-starred restaurant. A home from home for glitterati. Foodies - A range of restaurants and bars to explore, as well as Fischers Fritz Restaurant and its two Michelan Stars. Sights nearby - Nearby Französische Straße underground station is a great way to explore the city. The Grande Dame of Berlin's hotels. Large, luxurious and sophisticated rooms with smart fabrics and elegant furniture. Fantastic spa, restaurant and conference facilities for both business and leisure guests. A hotel that caters to every comfort in excess and in style. Great walks - Ask for the personalised walking and jogging maps and go through the beautiful Berlin Tiergarten. Sights nearby - Reserve an exclusive Berlin city tour at the travel desk.